DO NOT uninstall your WP EasyCart Free Plugin – Your WP EasyCart PRO plugin extends the functionality of WP EasyCart’s free software. 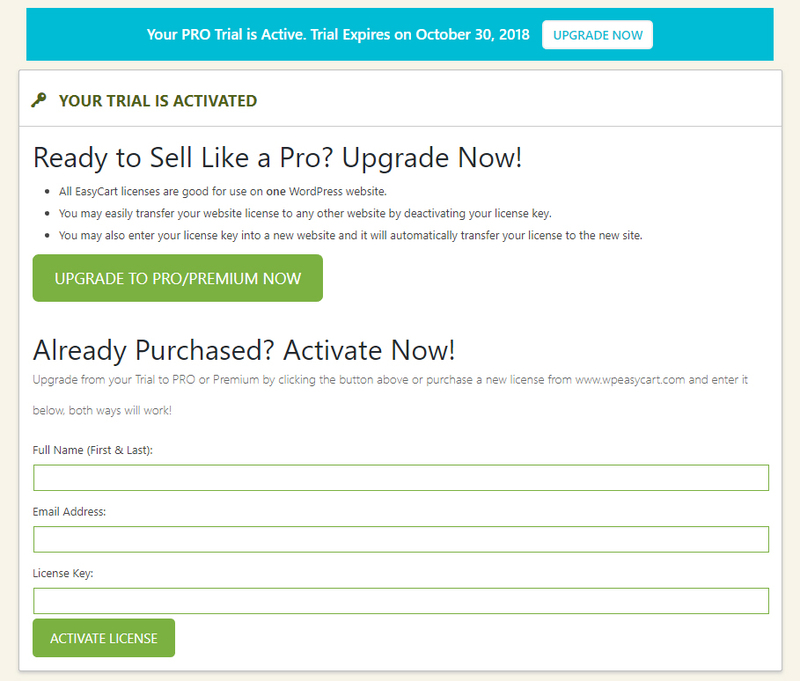 You must install WP EasyCart PRO through our automated registration panel OR your plugins panel before you can register your license. Once both WP EasyCart AND WP EasyCart PRO plugins are installed, you can complete registration below. If you previously activated your license on another site, the license will be automatically transferred to the new site. If you are a Premium user you will install the same software as a PRO user and can access additional extensions through your account here. To register your licensed edition, you must purchase a professional or premium license. With your purchase you will receive an extra plugin (available for download via your WP EasyCart account) to install by visiting your WordPress admin -> Plugins section and uploading this new EasyCart software. Once uploaded, you should see it installed as you would any other plugin. Activate the new plugin once installed. Once you have installed your purchased plugin and activated it, you may visit the WP EasyCart -> Registration section to begin registering. Open this section and enter your full name, email, and license key from purchase and simply press ‘Activate EasyCart License’. Once activated, you will have access to the various locked away components of EasyCart. **Note: Customers who have a valid license key may login at www.wpeasycart.com/my-account to view all transaction key, support status, and more! If you have the FREE edition or Trial running, your registration panel will allow you to license your software anytime you need to. You can automate the entire process by upgrading from your registration panel, OR, you can purchase directly from our site and enter your registration here.